If this wasn’t a Patek, I might call it frumpy, dated, or even busy. Although this watch has a few elements I don’t love (the hobnail bezel, Arabic numerals, and screwed lugs), it comes a lot closer than any other contemporary Calatrava. And it’s not (technically) part of that family! The 35.5 mm case is similar to the contemporary Ref. 5053 “Officer’s Watch” but has a single row of hobnail decorations around the bezel. The enamel dial has an old-fashioned look to it, with radially-aligned “half-flipped” numerals rather than the sedate vertical arrangement common on Calatrava models. And the spade-style hour hand really says “grandfather’s pocket watch”! Then there are the complications. No Calatrava should have a complication of any kind in my opinion, but this one has a moon phase dial at 7:00 and a power reserve dial at 10:30, with the subsidiary seconds shifted to 4:30 to make room. That moon phase decoration is really excessive, with a coaxial two-ended hand and colored pips duplicating the classic lunar disc. How odd for Patek to go to such excess on such a small watch? 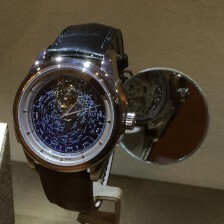 But this was a special piece for Patek Philippe, so I’m not surprised they went overboard. This was the first time Patek equipped any watch without a perpetual calendar with a moon phase indicator. Indeed, this one lacks a date entirely! Yet it’s still a special complication, accurate to 122 years and capable of being set forward and back with precision. The watch uses my favorite modern Patek Philippe movement, Cal. 240/152. The gorgeous, perfectly-decorated movement is visible behind the hinged “hunter” case back through a sapphire window. Be prepared to be mesmerized by that tiny but substantial 22 karat gold rotor! This amazingly-thin movement is the workhorse of high-end Patek Philippe watches, from the Calatrava to the complications, and has proven itself worthy. But some Ref. 5015 owners have had issues with that ground-breaking moon phase complication, so the buyer should be sure to get the watch serviced! The original gold buckle is included with the sale: Re-use that Hirsch on a Longines or Tissot! This particular Patek Philippe Ref. 5015 is listed in Auctionata’s January 11, 2017 auction. They estimate that it will sell for a surprisingly-low € 14,000, but I wouldn’t be surprised if it went for 50% more than that. Similar examples sell for over $20,000 these days, and this one does include the original case, box, tool, and brochure. I don’t see mention of the original paperwork, however. And the cheap Hirsch strap and fake-gold buckle are all wrong! Happily the lot also includes the original gold pin buckle so this can be rectified. I don’t spot any serious issues with this watch, so I will estimate a € 20,000 sale price and a very happy buyer! Update: Sold for € 15,000! A steal!